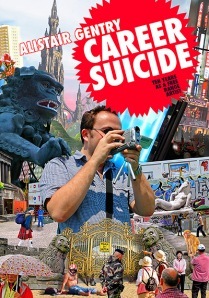 If British art schools today really want to teach their young students anything at all, they would do well to issue each one of them with a copy of Alastair Gentry’s book CAREER SUICIDE 10 years as a free range artist. In this autobiographical account Gentry talks about what it is to be an artist in contemporary Britain. Successful enough to earn a living form art, but not represented by the galleries of the plutocrats, the White Cubes and so on, nor being offered Turner Prizes, Gentry represents in some sense most of Britain’s active professional artists, going from gig to gig, residency to residency. But unlike most, Gentry is ready to spill the beans. It’s good that a lot of what Gentry says should be enough to put off people who want to be artists because they think it’s cool and glamorous. Gentry shows up pretty definitively that it isn’t. He describes residencies in frozen Berwick and the industrial wastelands of China. He shows us the venality of many in the art business and the callous cruelty of the “glam-art” world (as represented by a particular art magazine and its art-fair). His book is the counterweight to Sarah Thornton’s entertaining but somewhat breathy and admiring “Seven Days in the Art World” which I also enjoyed, but while Sarah comes as across as the ultimate fan-boy trying to pretend to be critical, Gentry is like the head miner forcing you down the mine on your first day, without a canary. Career Suicide reminded me why I don’t do residencies anymore: that feeling of being always bewildered and frustrated while your fate and ability to do anything (ANYTHING!) is decided by people you can’t even begin to build any relationship with. The media players that don’t work, the equipment that doesn’t get ordered, the endless meetings. Gentry is made of stronger stuff than me, or has a milder temperament. While Gentry titillatingly promises to name names and reveal the filthy laundry on big art world names, actually he keeps gossip to a minimum and is incredibly fair. Maybe for fear of libel actions but I think he just want to be fair and honest. He does have a hilarious section on the Venice Biennial, and one hitherto well-known Britart photographer whose behaviour must have been jaw-dropping at the time, but which makes good reading now and goes some way to explain why nobody has heard much about the guy of late. Yes, issue every first year art student with a copy. And every MA and MFA as well. Or, if you’re an artist and long out of education, read it and know you’re not alone. “Liking” a positive review of my own book…how’s THAT for narcissism? Thanks for writing such a thoughtful response, anyway.